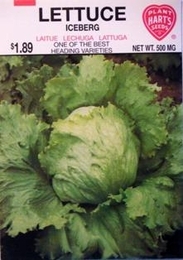 Iceberg is one of the best heading varieties. Head early and stands a long time without running to seed. Large heads of light green leaves with crisp tender hearts that blanch to a green tinged white. Make several plantings of lettuce during the season. As heads develop, every other one should be cut to give the rest more space to grow.